This website is targeted to learner's who want to learn MVC(Model, View and Controller) in step by step methodology. If you are one of those then you have landed on correct site - MVC Step by Step with simple theme to teach reader where every topic will revolve around step by step format. All contents and site nurturing is done by QUESTPOND – A decade old platform totally based on online form which provides e-Learning medium to learn and simplify IT technology. At QuestPond which is an educational platform contents are developed or goes written by other expert team members are reviewed by IT gem Mr. ShivPrasad Koirala. He holds 20+ years of experience in IT on .NET technology. Mr. Shiv is also been awarded as Microsoft's Most Valued Professional(MVP), Codeproject's Most Valuable writer, CSharp corner – MVP award and so on. QuestPond concentrates only on IT sectors and covers all technologies like .NET, C#, SQL Server, MSBI, Tableau, SharePoint, ASP.NET MVC, AngularJS, Design Pattern, Dynamic CRM, Architecture stuffs, Object Oriented Programming(OOP), Angular 2/4, Azure and many more open source and other Microsoft technologies. QuestPond teaching or any of its online content is truly simplified, so that even a slow pace learner can also understand and above all it is fun enjoying to learn complex topics. We are very much actively participating on stack overflow to help developers who are stuck with technical difficulties also available on social websites like Facebook, Twitter, LinkedIn including video site like YouTube. Our video training program are not just practical oriented but also covering theory in parallel topics exactly to the point hitting the bulls-eye. Not our words just say but you can actually make out the difference by going through videos sample topics from each section covered are present on YouTube channel to understand more. Our shared for most of the video topic on YouTube will always help you to understand our way of teaching and can judge the best of our teaching quality. For more information about our videos and training style please note our watch our "questpondvideos" named videos channel on YouTube also our videos are also present on DNFVideo (@ DotNetFunda Video Channel). Both the channels are updated with most recent and useful video topics. We have many videos covered for exact topics and content list do visit QuestPond website which will give clear picture of learning stuffs availability. A wide range of currently running technology and most of them are very hot also must learn by every developer under one umbrella - QuestPond. Here is a glimpse trainings on MVC , MVC 5, MVC Core, C# or C Sharp, C# Threading, CSharp generics, .NET, ASP.NET, Tableau, MSBI (SSRS, SSIS and SSAS), TFS, ADO.NET, SharePoint, Function Points, Software Architecture, Design Pattern, UML, jQuery, JSON, WPF, Object Oriented Programming(OOP), Localization & Globalization and many more. Our learn MVC, tutorial website is specially designed to help you learn MVC tutorial as quick as you can and efficiently as possible. 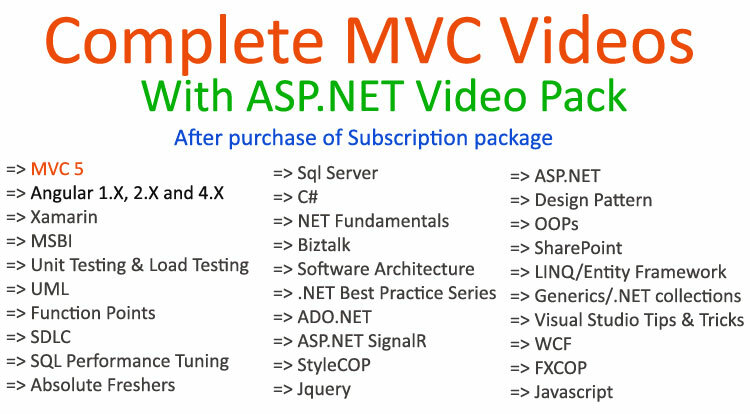 Here you can learn MVC(Model, View and Controller) step by step. It covers the entire recent version required to accomplish modern day's software project and because of that it is necessary to learn MVC, MVC 5 and MVC Core with the recent one .NET Core 2.0. For our website subscribers/customers we do provide complete end-to-end support for video doubts via email if not resolved via mail then Skype call is given. every weekend evening 1 hour we do take live training sessions which includes angular and other new topics. With the 650+ videos library which we have under subscription has facility to watch videos by learners at their own leisure. To know more in-depth we do offer self-training materials videos in DVD videos so that it can viewed even if you do not have internet. With technical support videos become easier to learn. Prior to videos releasing we had also released lots of technical books offline which are sold via shops and online portal via www.bpbonline.com, Flipkart.com, Amazon.in. Our best sellers books based on interview preparation theme on JAVA, .NET, SQL Server. Other titles releases as Software Architecture, C-Sharp and ASP.NET project, Angular Step by Step, Software testing, Networking and many more. Apart from self-study learning videos materials our other two arms of full strength are training medium which we offer through online based and offline based trainings present in Mumbai. With the online based trainings which can connect to anyone across any region or country. Online trainings will be held via Microsoft Live Meeting. While for offline based trainings, currently it is running in our center located at Sakinaka, Andheri- Mumbai – India. QuestPond also undertake corporate based training at various locations majorly in Mumbai and also conducts on various other locations outside Mumbai and within India. To know information regarding corporate training which we conduct - to know more kindly contact us. For any more/other information, video related doubts and technical support (for our members only) and training details feel free to contact us in below mentioned contact details. We are simple people working around technical aspects and delivering contents to learners in easy step by step manner. So feel free to get in touch with us on the below given email ID's and numbers. Copyright Â© 2017 Learn MVC Step By Step . All Rights Reserved.